In 2005, San Francisco Beautiful recognized Shotwell Greenway with a Beautification Award. Plant SF’s Jane Martin and her neighbors on Shotwell Street were concerned about illicit activities occurring at all hours in and between the cars parked on the street and sidewalks. Jane created a pilot project for “greening” the sidewalks with cut-out areas, rocks and low fuel plants. The result has been the introduction of ‘permeable landscapes’ in front of nearly every property between the sidewalk and the curb. Plants requiring more attention are grown in metal containers placed on the sidewalks that also serve as bollards. 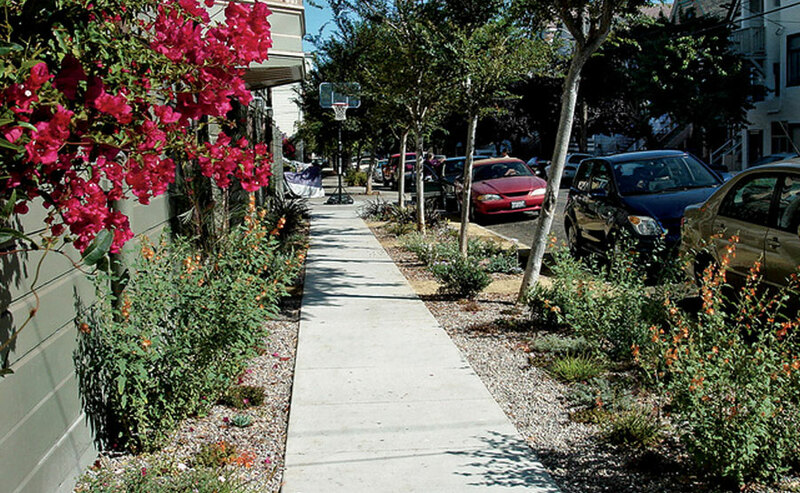 The result is a block with cars parked on the street and sidewalks filled with drought tolerant plants within rock beds. Cut outs allow rainwater to drain through to the subsoil, thus helping to replenish the ground water instead of flowing into the over-taxed sewer.